Contact me about inclusive sports and activities. 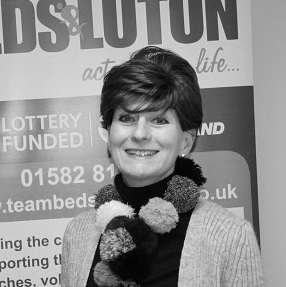 Originally I joined team Beds & Luton to coordinate the Sportivate programme back in 2010 but have since become responsible for the implementation of our new county Inclusive Sport programme No Limits. Equitable access is by biggest driver when it comes to sports participation, rather than being committed to anyone sport in particular. Saying that, I can still claim to be a regular runner with over 30 years and considerable mileage under my belt! Native to Yorkshire, I found my Mr Wright here in Bedfordshire and now have two children who I tend to ferry round most weekend to varying sporting fixtures. I am a hopeless spectator, and can often be seen anxiously pacing round rugby pitches or sports halls watching our kids compete ! I long for spare time to cultivate a hobby, but with a pending house extension in 2015 I may have to put that on ice for the next 12 months. Creating more quality opportunities for people with a disability to access sport is my passion.